(CNS): The Cyber Rays team from Cayman Prep High School robotics club has come away from Florida with a new trophy for the school cabinet. This time the rookie team, who are enjoying a dream season, came away with the Florida State trophy for Innovation and Strategy at the First Lego League (FLL) Florida Championships held on Sunday, 26 February 26, at Florida Institute of Technology in Melbourne. Allison Smith, the ICT Instructor and Coach of the group, was also the winner of the Coach Award. This is the first year the team has competed in the FLL event and at the State level and it was up against 47 other outstanding teams. The team they were also awarded the most coveted prize on offer which is one of the 7 invitations to compete at the World First Lego League World Invitational Open Championship in May at Lakeland / Winter Haven, FL, with closing events at Lego Land. At this event the team will be competing with 64 teams from around the world. This year globally over 17,000 teams competed in a 'Food Factor' challenge with missions using the robot to clear bacteria, reverse pollution, safely transport groceries, harvest of corn, and eliminate viruses and many more. Each mission has to be solved by the students with only coaching by the adult mentors. The team uses the Lego NXT-G programming language and only official Lego parts and sensors. There are three additional but important aspects to the event. The team has to research, prepare and present a project on the food safety theme with the Cyber Rays developing a solution to combat milk spoilage and have consistently impressed the judges with their innovative solution for a milk dispenser in a fridge door. Secondly, the robot is judged in a technical session to review the process from start to final robot including lessons learned and changes to the programme. The team presented a well-documented technical workbook with design method and prototype challenges, along with details of the programming code used in each mission. Finally, and perhaps most importantly, the team is judged on its understanding of the FLL Core Values, with the key learning point being to always demonstrate 'Gracious Professionalism' and 'Cooperation'. 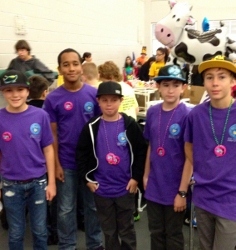 The top scoring team of 48 at the FLL State Final earned 272 points on the table, with the second place team 206. The Cyber Rays top score of the day was 169 (the highest they had ever scored even in practice), a fantastic showing for a first year team with all kids 13 and under. There are five possible FLL Robot-based awards: Overall, Performance (for highest score on the table at the event), Programming, Innovation & Strategy, and Mechanical Design. A team can only win one of these awards at any one event, and not all events have all five awards. In their quest to the Worlds this season the Cyber Rays have won three of the five FLL awards in the course of the three events they have attended. They won the Performance at the Clearwater, FL, Qualifier with 16 teams competing, the Programming at the Tampa, FL, Regional with 32 teams competing, and Innovation & Strategy at Melbourne Florida State final with 48 teams competing. To win programming, innovation, and mechanical awards, the team present and run their robot for a panel of expert judges who ask them questions about their robot and their solutions to the missions. The team brings a computer with them and the judges review the details of their programming and ask them very specific and detailed questions. During initial judging at State, the team was asked about the programs they wrote. The judges were impressed with the use of an “ALL IN ONE” program versus separate programs for each mission used by all the other teams), and the use of Loops and Switches. Because the judges spent so much time on the programs during initial judging, the team was ‘called back’ for a second round where the judges focused on the mechanical attachments. Both elements are considered for the Innovation and Strategy award they were given. Dr Scott Evans who has designed all the tournament boards and missions for the past 10 years was at the tournament. He is one of the FLL visionaries and celebrities and noted that he was impressed with the simplicity of the solution the Cyber Rays had for the return of a trailer. While 7 teams celebrated the journey forward to the World Invitational Open, the State tournament meant the end of the road for 41 teams, including great friends of the team, the Mustache Motors of Tampa, FL. This team of two girls (Jenna and Tillie) and two boys (Chris and Joey) have been the epitome of Gracious Professionalism and were fast friends of the Cyber Rays from the qualifier in Clearwater, FL. Their parents and coaches have stored our bulky items between tournaments saving the team on travel costs. Prior to the start of the State Tournament we all met in Orlando for a day of fun, a shining example of the camaraderie that builds within FLL. The Mustache Motors plan to join the team again as supporters at the World Invitational Open, and plans are already underway to have them come to Cayman so that the two teams can do a demonstration tournament (the long term goal is to establish a FLL regional qualifier here in Cayman with other schools, home school groups, or after-school clubs competing).